Though there is change in SEO search engine optimization every now and then, from Google penguin to panda but the one fact which cannot changed is importance of backlinks. Its obvious that your site would rank higher based on the number of quality backlinks you've gotten. I hope you guys know what is backlink and its importance. Well, those who don't know about backlink. Backlink is a link to your blog coming from other blog or site. So, simple as many as backlinks your blog have, it will rank higher in search engine. But from 2015 the "Quality" of Backlink matters. Suppose "A" blog has backlink form any low PR blog/site and "B" blog has backlink from amazon (high PR site). So obviously "B" will rank higher in Google search engine. There are two different terms in backlinks i.e "NoFollow" & "DoFollow" backlinks. Do-Follow backlinks are most important if your wanted to come in first few pages of Google search results. While, no-follow backlinks does not count by Google but it is equally important when it is coming from high PR blog/site. So, you must be thinking why BacklinkWatch or backlink checker tool is important ? See, with this you will be able to know from which blog/website you have gotten the backlink. Second important use is, you can check your competitors backlinks too. So, lets see the top 5 free online backlink checker tools. Aherfs is pretty new tool founded in 2011. It has most attractive UI and provides you the detailed backlinks report. Ahrefs is paid tool but free version is also quite impressive. So, try using this tool today. Just enter your domain and you will get complete backlink analysis report along with anchor text report. It will also tell you the number of links coming form .gov, .org. .edu, etc sites plus nofollow and dofollow backlinks your blog have. Ahrefs will also tell you about new and lost backlinks. So, you can also recover from penguin update. Ahrefs is worth using tools ! BacklinkWatch is one the most popular and oldest online backlink checker tool. It will give you the detailed description about outbound links, nofollow - dofollow backlinks and also PR of your blog. However, still there is one thing which I don't like about BacklinkWatch is its pop-up ads. Though it can be closed with the single click but still it become frustrating sometimes. Open Site Explorer is my favorite tool. I'm using this tool to check backlinks on my blog. Open Site Explorer is famous because of "comparing backlinks between two or more domains" feature. So in short if you want to compare your domain with your competitors, then you must try your hands on Open Site Explorer. Link Diagnosis has some medical kind of logo but still its a worth using tool. 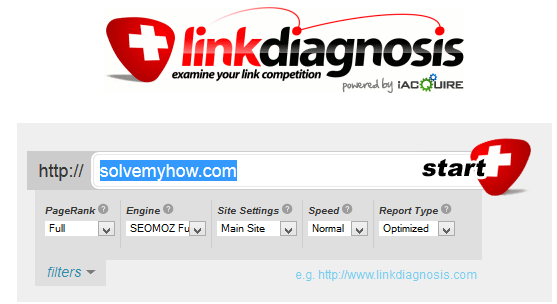 Link Diagnosis provides you many features while checking the backlinks of your blog. You can set many options such as PageRank, Engine, Site Settings, Speed and Report Type. You can use many features such as you can get the detailed report of optimization, You can check the backlinks of single page or of entire website. P.S :- This tool works best with Mozilla Firefox browser. Rank signals is another worth using backlink checker tool. Well, you can use this tool to check total number of backlinks, link anchor text, PR of the domain from where backlink is coming. You can also check your current alexa rank and total number of Facebook, twitter and Google Plus shares you've gotten. So, these were the top 5 fastest backlink checker tools that you can use right now to analyze backlinks of your blog. Hope you found this article helpful and worth reading. Please share this post with your G+ and twitter friends. You can also get free Blogging, WordPress and SEO tips right into your inbox [Subscribe for SolveMyHow Newsletter]. Let me know if you know any other tool to check backlinks in fastest manner.